The Finnish Institute at Athens would like to invite you to the opening of our next exhibition, “Three European Tragedies – The Civil Wars of Finland, Spain and Greece”, an exploration of three civil wars on the edges of 20th century Europe. At the opening of the exhibition a debate will take place in English among the historians Polymeris Voglis, Henrik Meinander, Jussi Pakkasvirta and Aapo Roselius. The debate will be moderated by the journalist Mikaela Khartouli and the historian Maria Sabatakaki will also participate in the discussion. 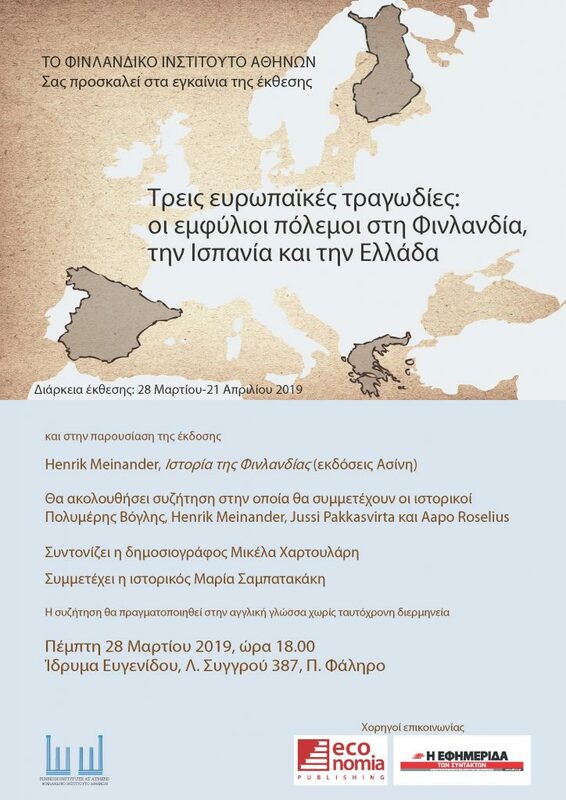 The event will take place on 28 March at 6 PM at the Eugenides Foundation (Siggrou 387, P. Faliro). The exhibition will be open from 28 March to 21 April at the same location.